I'm really excited to show these Alto rental illustrations and was so happy with the project from the beginning. I got the go ahead to draw whatever I wanted, bearing in mind that these needed a central figure and icons representing the neighbourhood of little portugal on Dundas St. West in Toronto. 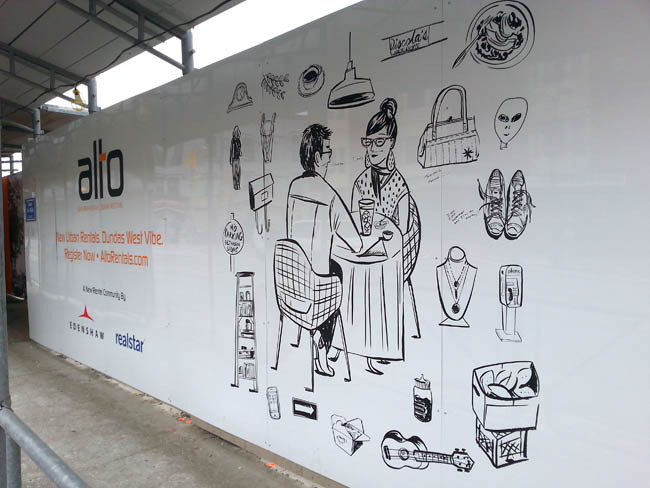 They are being used as hoarding around the Alto Rental/Edenshaw Development site at Sheridan Avenue and Dundas St. West. I was just over there to take some pictures, and they've been 'added to' already, but so far nothing lewd, and surprise, surprise, thoughtfully implemented. You can view the unadulterated versions in my illustration work.